− 4 = zero Required Please enter the correct value. According to Money Morning Global Energy Strategist Dr. Kent Moors, oil prices in 2018 still have plenty of upside. 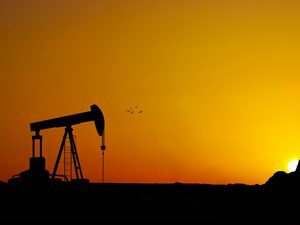 Despite West Texas Intermediate (WTI) crude oil prices trading north of $70 per barrel, two oil markets that Moors is following still hold a bullish signal. WTI is the U.S. oil benchmark trading in New York. Brent crude oil, or North Sea Brent, is the benchmark trading in London. The difference in price, or the spread, between the two is now quite narrow, and historically that points to a bullish market for both. WTI and Brent are both crude oils but their compositions are a bit different. In fact, WTI is dubbed "light and sweet" crude, which refers to the sulfur content of the oil and how easy it is to refine into gasoline and other products. Brent is just a little less sweet than WTI. Just for contrast, oil from OPEC countries has a much higher sulfur content and is called "sour." Another difference is the location from which each is pumped. WTI is from western Texas and parts of New Mexico in a region called the Permian Basin. Brent is from several areas in the North Sea, the body of water north of Europe between the United Kingdom and Scandinavia. But there is more to the relationship than which one has less sulfur. Being more centrally located to the world's commerce centers, Brent enjoys a premium price over WTI. That has been in effect for the past eight years. Brent also seems to react quicker to global demand. But right now, Brent's premium over WTI is extremely small. The price spread between the two is unusually narrow. "International demand has remained strong but it is the supply side of the equation that has experienced production pressure," Moors said. The combination of an OPEC-Russia agreement to cap production, the implosion in oil volume coming from Venezuela, declines in Libya and Nigeria, and continued stagnation in Mexico has been augmented by a multi-month disruption from Canada. Simply put, the recent Russia-OPEC production hike will not make up the difference. Supplies should remain tight and that means upward pressure on prices. All of this means global supplies are down and demand for WTI is up. That's what made the spread tighter. American producers will ramp up production but there is little excess capacity remaining at U.S. ports to get it to where it is needed. The other shoe dropping on oil supplies is geopolitics. The ban on Iranian oil imports does not hurt domestic markets much but overseas it has a chilling effect. Sanctions on foreign importers would deny them access to the U.S. market, and their assets inside the United States could be subject to penalty. In other words, another source for oil is cut off from the rest of the world. The more practical question is how can investors cash in on this bullish oil market? Using the proprietary Money Morning Stock VQScore™ system, we've identified three stocks to help you profit from rising energy prices. In fact, all three stocks carry the highest rating the system awards.